The Delta Agricultural Weather Center is located at the Delta Research and Extension Center in Stoneville, Mississippi. The Center is a joint effort between the Mississippi Agricultural and Forestry Experiment Station and the Mississippi State University Extension Service. The purpose of this Center is to provide historical and up-to-date weather data and products to aid farmers in making agricultural decisions. On March 31, 1996, the National Weather Service located at Stoneville, closed its doors. Through volunteer efforts, weather data collection continued as it had since 1915 so there would be no gap in historical data. It was soon apparent there was a need for public access to weather data and a Federal Extension grant was secured to fund a central weather project. This grant allowed the Delta Agricultural Weather Center to become fully operational in May 1998. The Center began operation with three on-farm sites recording weather information daily. Other sites were added and continued to be added throughout the entire Delta region. The Center currently has 19 fixed weather stations and 20 seasonal stations. 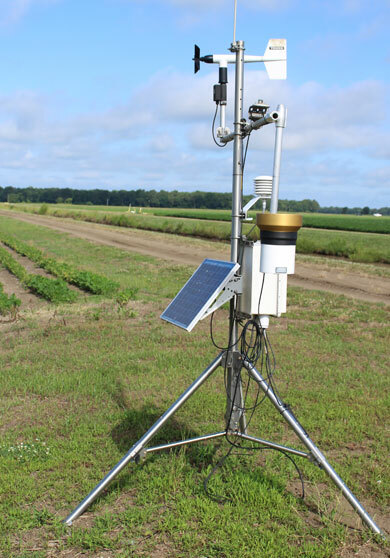 The automated weather stations measure precipitation, temperature, relative humidity, wind speed and direction, solar radiation, and soil moisture and soil temperature at various depths. Wind data are available every 15 minutes. All other parameters can be found on an hourly and 24-hour basis. Data and tools are available on the website, deltaweather.extension.msstate.edu. The site includes current daily weather information, historical weather information, DD50 and DD60, planting date information for cotton, corn, rice, and soybeans, and pond temperature predictions as well as other tools.